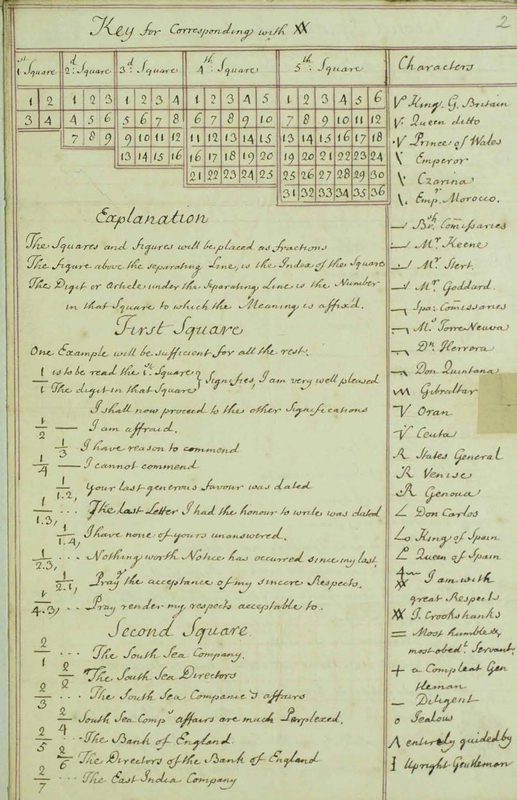 Apropos past posts on intelligence, I just came across a Japanese website that has an English page on the codes and ciphers used by the English during the Spanish Succession. Presumably the webmaster has an interest in historical cryptography (why not? why not indeed). With the exception of a few dozen pages on various early modern ciphers and codes (including American Revolutionary), the rest of the site seems to be in Japanese. Apparently ciphers are a subject best discussed in English. Nice. As a kid I played with codes, probably every kid does, but one like this I have never seen. If I am not mistaken, it is more a symbolic code, with each character representing a sentence or person of note? Does the cheat sheet also reveal what, for example 5 / 11.5 means? The number of combinations seems almost endless, so I wonder if there was some logic behind it. I think it’s instructive that there were codes for such important statements such as “your most humble & obedient servant.”. Things have changed on the surface, but I wonder if they are fundamentally the same? When I worked with brevity codes in the US military, we had codes for important info like contact made, send help, KIA & WIA red force/blue force, coming “home”, etc. Those codes went over secure comm systems and were transmit only. The goal of the brevity code was not to protect the info–the SIGINT and COMINT engineers gave us a “black box” that had all the e-ciphers in it–but to make for quick and efficient trx of info to higher echelons. In the old days, they’d burn the key; today, you just put a round on the X on the box, and that “zeroizes” it. If there was ever any doubt that your box might be compromised (or you could be compromised), the instructions were clear to keep one round for the box. IMHO, all this super tech did was lead to an over abundance of information…I remain convinced that some guys conviently forgot their black boxes becuase they preferred to operate without having to report every detail to the PTB. Who can blame them. Sometimes you’d rather not give out the info, especially if things go badly. In my research, for example, I learned that it took Wm Johnson the better part of a week to report to Wm Shirley that he had engaged the enemy at the Battle of Lake George. WJ managed to report to his friends in govt in less than 24 hours. Interesting stuff. I suppose it’s possible they would have codes for such mundane things in order to keep the cryptographers guessing as to what was important info vs. what wasn’t? Or maybe it was just a handy way to cut down on their amount of writing required. Analyzing time delays in communications would be interesting – I think a lot of the info is there for the Spanish Succession, it would just be a lot of work to do for thousands of letters (the Dutch were particularly good at noting when incoming correspondence arrived). This also leads to the whole debate over cabinet war and centralized command.